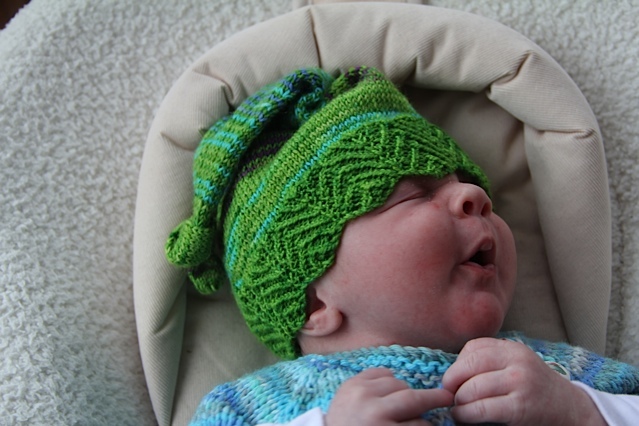 Five years ago I conceived a hat for my beloved Elfbaby. It would – of course – be a pixie-style hat, with a long point. It would have a garter stitch chevron border, to show off handpainted yarn and to allow plenty of stretch for growing heads. I planned to publish a pattern. I failed to do this. I don’t really remember why. Normally it’s the photos that hold me back (I do have something of a track record with failing to publish patterns) but evidently, we had pics. All I can say is… baby. And business. I wasn’t at my most productive. Since then, I’ve had another baby, had another go at the pattern (adding two different border options, because pretty! ), and churned out a whole stinking heap of these hats – for samples, for gifts, for my kids, who love them but keep on losing them! Sometimes, tragically, before I manage to take a photo. 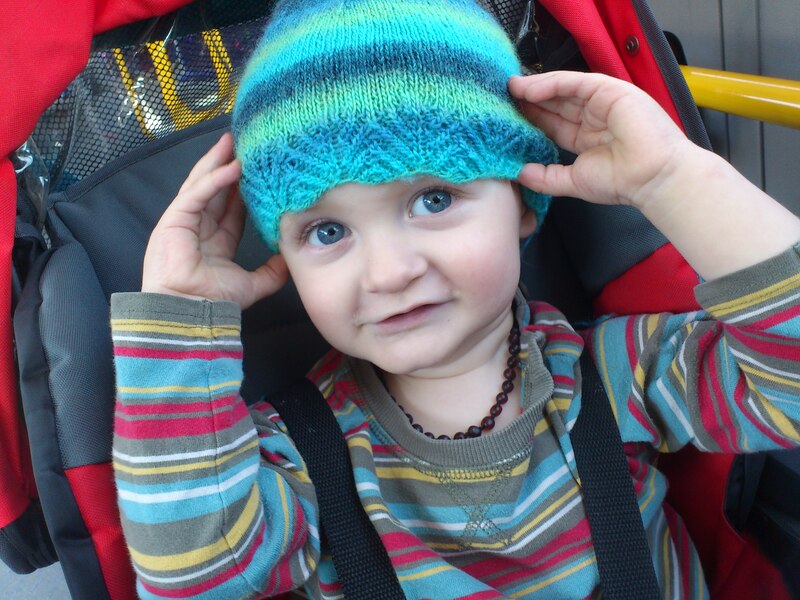 As was the case with Max’s first Elfhat, which – in light denim-coloured Clan – was such a fine hat, a stranger stopped me in the centre of Zurich to gush that it was a “Kunstwerk”. Oh well. I just made more; it was a great chance to test the different sizes. Enter lovely Lorna, a Twitter friend whose photos I’d particularly admired for ages. When she volunteered to test knit the pattern, I begged her to also contribute some pictures, which she generously did. Thank goodness for Lorna. 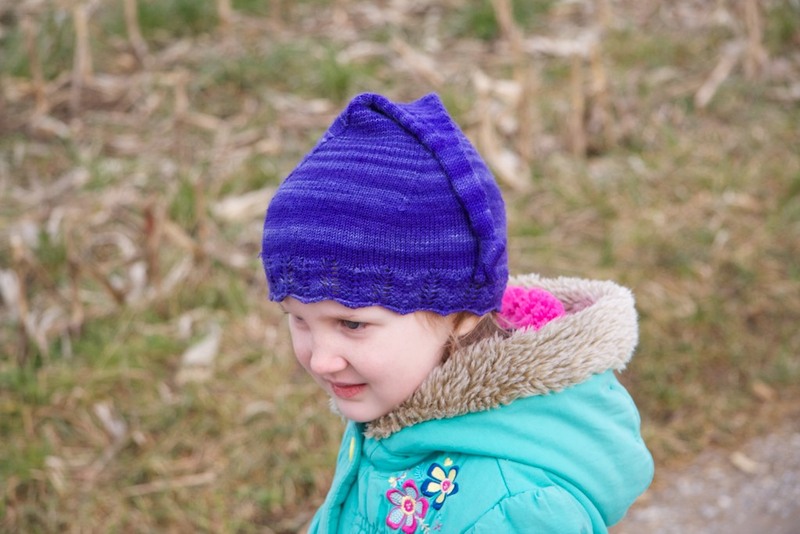 With the help of her and her adorable baby – plus a few extra months in which I knit another passel of hats and had to keep giving them away, but finally managed to achieve a photographable Pippi sample – I finally have a pattern. It’s the first I’m offering for sale. It’s only five years late. I hope you like it. PS. Enter the code ONLY5YEARS at Ravelry checkout to enjoy 50% off the price until the end of August! ETA: Patricia pointed out in the comments that this code doesn’t work using the “buy now” button above – I’m sorry. However, if you want to buy and don’t have a Ravelry account, please email me; I’ll be happy to refund €2 on any full-price purchases while the promotion lasts. Previous Post Vive la difference? Hm, good question. The code was created for the Ravelry store and so it doesn’t work with a straight PP checkout; I also can’t create a Paypal voucher, unfortunately. I can however offer manual refunds. Love the hat, very cute design!